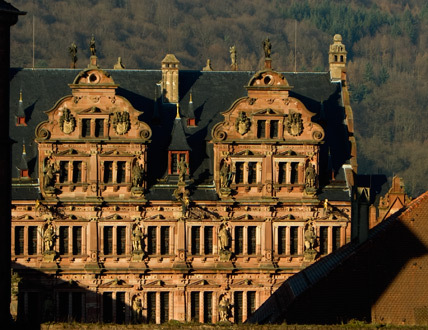 Heidelberg Castle is the epitome of all that is romantic. The castle is fascinating. 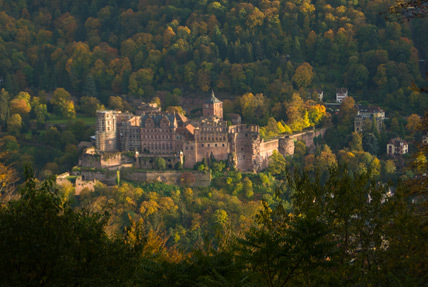 One can hardly keep one's eyes off it, situated majestically half way up the Königstuhl hill above Heidelberg, partly as it was originally, partly in ruins. It has been sung of by many a poet and glorified in many a painting. 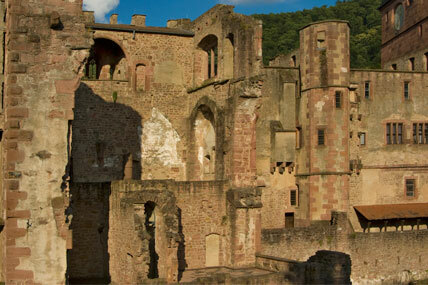 Perhaps it's just this mixture of preservation and destruction that makes the castle seem so romantic. 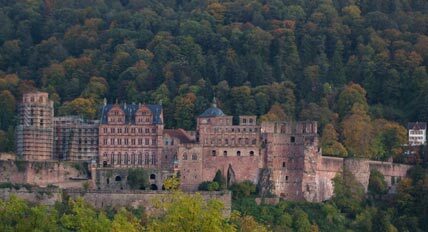 The Elector of the Palatinate's castle has seen a great deal of history; the storms of time have left distinct traces of destruction upon it. Before the palatial castle was built, there was already a simple castle on this spot although little is known about it. Stony remains found during renovation work testify to the existence of this earlier castle. 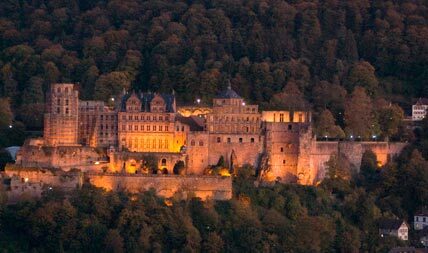 Heidelberg Castle is set on a natural terrace on the steep slopes of the Königstuhl. The actual history of construction began in the 15th century. At that time palaces were also fortresses for defense as seen today in the towers destroyed during the War of the Palatinate Succession. Almost every generation of Prince-Electors added new buildings to the castle and these were named after the Elector who had them built. 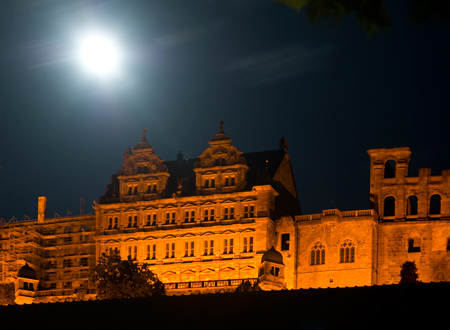 This photo of the Friedrich Wing at dusk was taken from the Philosophers' Walk on the other side of the river. With the Thirty Years' War, however, the period of construction came to an end and instead the general destruction of the castle began. 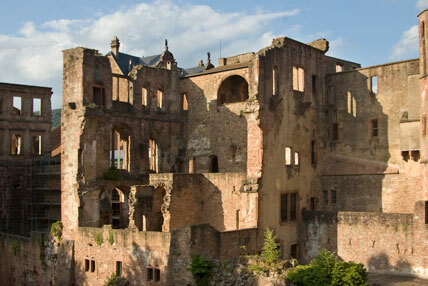 Tilly seized Protestant Heidelberg in 1622, leaving the town devastated and the castle for the most part in ruins. 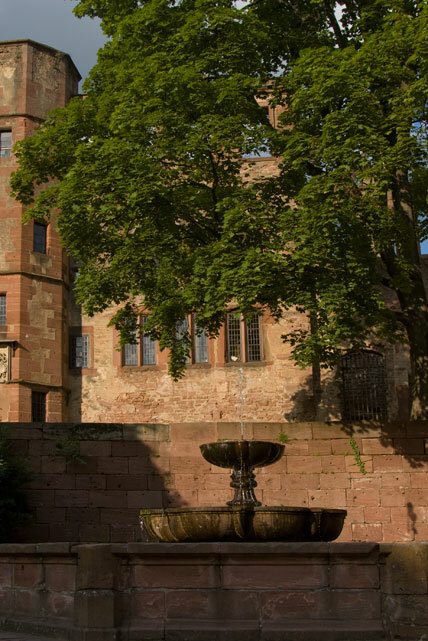 From 1649 onwards the castle buildings and grounds were restored once more and the town rebuilt. But peace didn't last for long. When the Prince-Elector Karl I Ludwig died without children on 28 August 1680, the War of the Palatinate Succession erupted as even the French king claimed hereditary rights to the land and the powerful position of Prince-Elector. 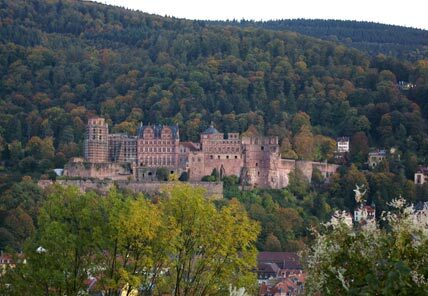 In the course of the War of the Palatinate Succession Heidelberg was twice conquered and destroyed by French troops. 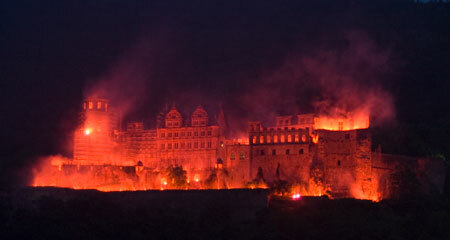 On 2 March 1689 the French troops set the castle and town alight. 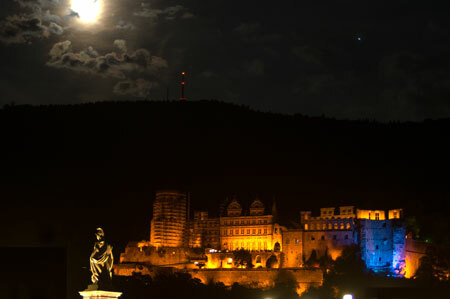 This huge fire in which Heidelberg became victim to the flames is commemorated with fireworks three times a year during the Heidelberg Castle Illuminations. The only building in the town to survive the fire was the hotel "Zum Ritter". 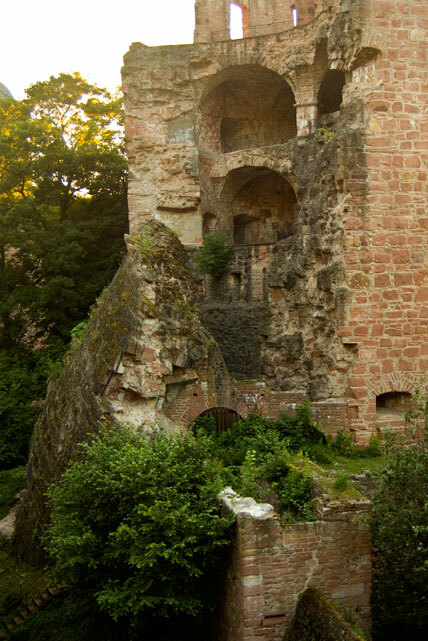 The unpopular Catholic Elector Johann Wilhelm from the Palatinate-Neuburg line took up residence once again once this dreadful devastation had passed and was the first to have the ruined town walls and the defensive towers restored. 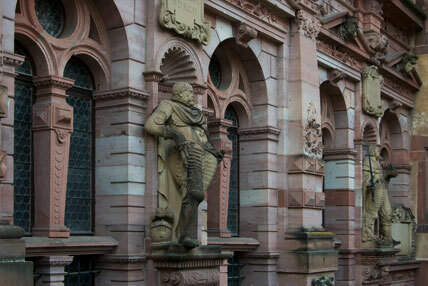 When the French tried to attack Heidelberg again in 1691 and 1692 the town was now in such a good defensive condition that they retreated again without carrying out the attack. However, on 18 May 1693, the French troops came back again with considerable reinforcements and captured Heidelberg on 22 May. As they found themselves unable to seize the castle they once more began to destroy all that had been left of the town of Heidelberg. When the garrison of the castle then capitulated on the very next day, the French troops finished off what they had failed to destroy during the first attack and blew up all the defense towers of the castle. One of the towers, the "Krautturm", blown up by the French troops. The War of the Palatinate Succession did not end until the Peace of Ryswick in 1697. France had not been able to enforce either its territorial claims nor those connected with the Palatinate Succession itself. 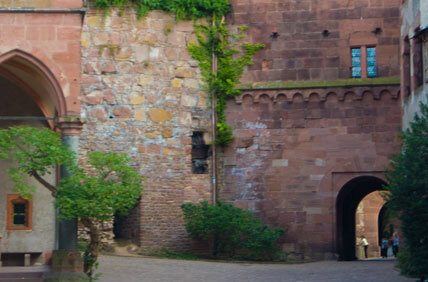 Inside the castle courtyard, view to the west. However Alsace as a whole – including the imperial city of Strasbourg – was taken over by France and has remained so to this day apart from a few short interludes. The unbelievable brutality of the French troops, which had never been seen previously, later contributed to the legend of the hereditary enmity between Germany and France. 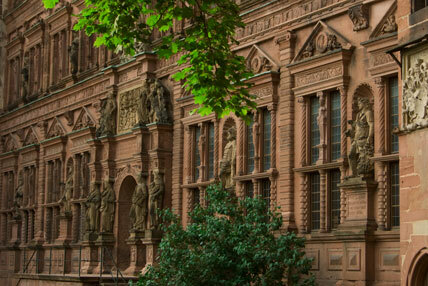 It was this brutality that the most famous Renaissance town north of the alps – Heidelberg – fell victim to. 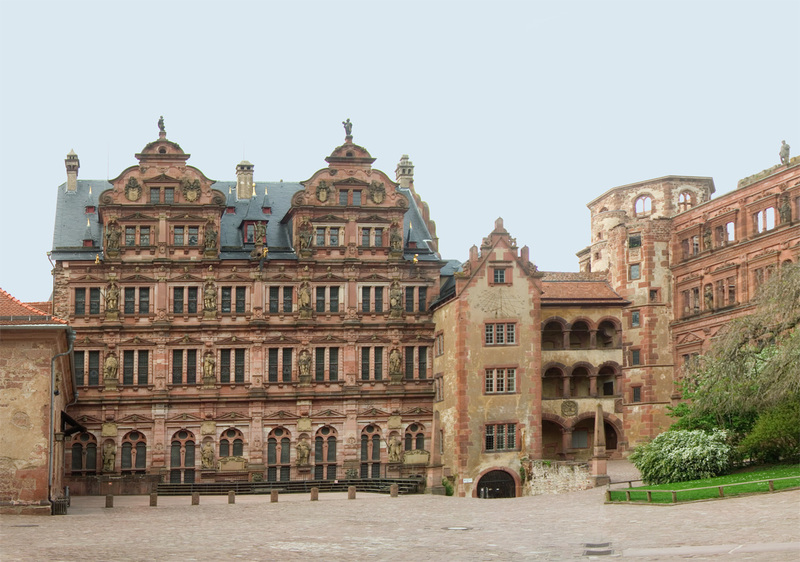 The heir to the title of Prince-Elector, the Catholic Elector Johann Wilhelm from the house of Wittelsbach Palatinate-Neuburg made himself so unpopular in Heidelberg that he was forced to move his seat of residence to Mannheim. 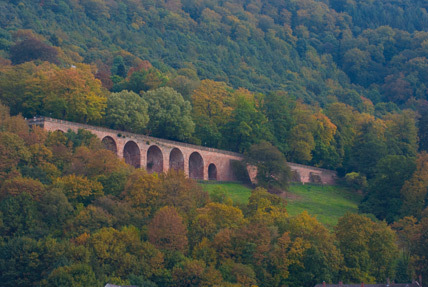 He no longer paid any attention to the restoration of the town and castle of Heidelberg, wishing, on the contrary, that "grass would grow over its streets". 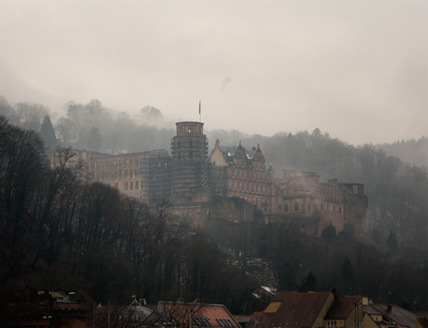 His successor toyed with the idea of moving his residence back to Heidelberg and began to rebuild the castle. 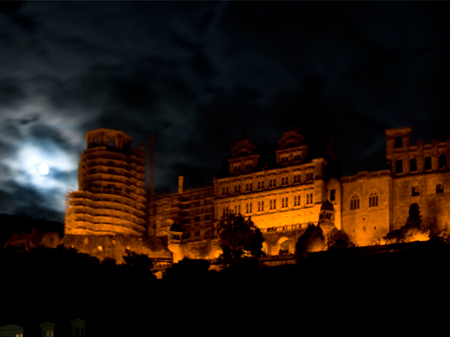 However, before he could move back into the castle, two devastating strikes of lightening on 24 June 1764 caused him to abandon the idea of further renovations. "One might say that the very heavens had intervened. On 23 June 1764, one day before Karl Theodor was to move back into the castle and make it his seat (which, by the way, would have been a great disaster, for if Karl Theodor had spent thirty years there, these austere ruins which we today so admire would certainly have been decorated in the dreadful pompadour style); on this day then, with the Prince's furniture already arrived and waiting in the Church of the Holy Spirit, a bolt of lightening from the heavens hit the octagonal tower, setting light to the roof, and destroyed this five-hundred-year-old castle in only a few hours." 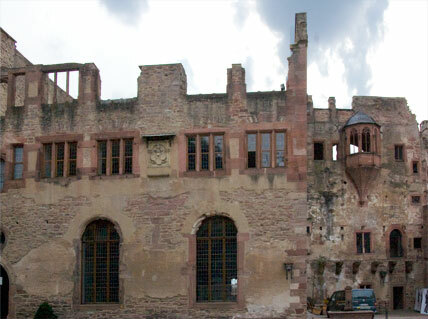 So the castle has remained for us as it was after the fire caused by this storm: still intact up to now, one of the most important Renaissance buildings north of the Alps, spared all modernizations and perhaps also disfigurations of later times. 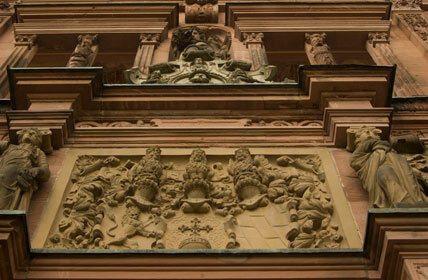 Heidelberg itself was built up anew in the Baroque style on the foundations of the houses that had been burned down. 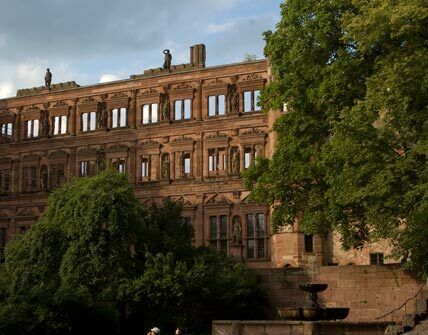 Join us on a virtual tour of Heidelberg Castle.